You'll be £17.50 closer to your next £10.00 credit when you purchase Wellington's Brigade Commanders. What's this? 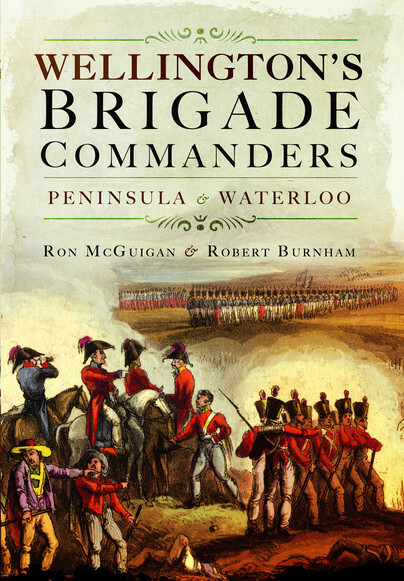 Recent research into the Duke of Wellington's armies during the Peninsular War and the Waterloo campaign has enhanced our understanding of the men he led, and this new biographical guide to his brigade commanders is a valuable contribution to this growing field. Ron McGuigan and Robert Burnham have investigated the lives and careers of a group of men who performed a vital role in Wellington's chain of command. These officers were the brigadiers and major generals who, for a variety of reasons, never made the jump to become permanent division commanders. Their characters, experience and level of competence were key factors in the successes and failures of the army as a whole. Their biographies give us a fascinating insight into their individual backgrounds, their strengths and weaknesses, and the makeup of the society they came from. Each biography features a table covering essential information on the individual, his birth and death dates, the dates of his promotions and details of his major commands. This is followed by a concise account of his life and service. This is an excellent piece of work, and I expect to find it very useful! Painstakingly researched, fast paced and intelligently presented. This is a vital, thought provoking and moving book of reference for serious scholars of the Napoleonic Wars. This title provides a ‘who was who’ covering 71 of the Duke of Wellington’s generals serving as brigade commanders during the Peninsular War and the Waterloo campaign 1815. Based on their painstaking research into the background, career and character of each officer, the authors give factual information on the career of each commander and an evaluation of his performance in the field, offering fresh insight into the men who played a vital role in Wellington’s chain of command. Ron McGuigan, from Canada, is a recognized specialist on the British Army of the period, who has been researching the era for forty years.